I’m still behind from my vacation, so no rant today. I’ll get back to my complainy ways next week. Today, do your best to enjoy my performance update for May. My main goal is to build a portfolio of $1,000,000 in 1500 days with no debt*, starting from 1/1/2013. Every month, I provide an update on my status. My goal for 2015 was to get my portfolio up to $874,353. Because we saw exceptional returns in 2013 and 2014, I have already accomplished this. Let’s have a very late look at May. Yep, this month, I reached a new high. No, not that kind of high! Just because I live in Colorado doesn’t mean that I indulge in the recently legalized green stuff. Get your mind out of the bong people! While I don’t indulge in Colorado’s newest cash crop, the same cannot be said for Spendosaurus. 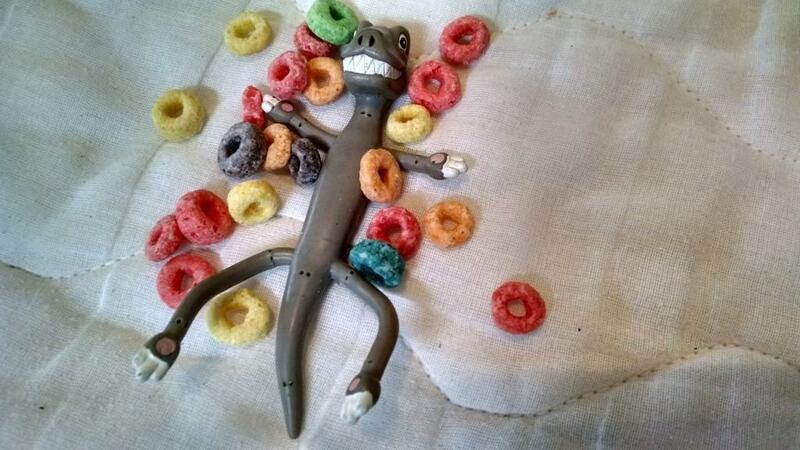 In his altered state, he couldn’t find the Cheetos and had to resort to Froot Loops. I’m talking about another kind of green stuff; money! In May, my investment portfolio reached a new all time high ($1,036,272). Life is good, even if only my portfolio and Spendosaurus are high. Mr. PoP: You’re mostly in stocks, aren’t you? Me: Well, I own stocks, but now, most of my investments are in safer assets like ETFs and mutual funds. First and foremost, I haven’t written about it in a while. Last time was here, here and here. A bit has changed since then, so I’ll be publishing an update shortly. As of this writing (6/10/2015), I have $166,015 in Apple and $164,280 in Facebook. I am not comfortable with having almost 1/3 of my portfolio in two risky stocks. Technology moves fast and either of these could easily be irrelevant in 10 years (remember Nokia, Nortel and Blackberry?). I sold a bit of Apple a couple months ago and will continue to whittle down these holdings. I lied to Mr. PoP. Well, lie is too strong of a word, but about 50% of my portfolio still consists of individual stocks. While I think it’s OK to have a portion of money in stocks if you like to play, it is mostly a losing strategy that the overwhelming majority of people would be wise to avoid. Although this advice comes from someone who has had great success with stocks – I’m currently sitting on four 10 Baggers (Google, Apple, Chipotle and Tesla) – I have been extremely lucky that my speculative gambles have panned out. Many more people have lost a lot of money in the stock market because of poor choices, so take my advice to heart. I look forward to converting most of my portfolio over to Vanguard funds in the near and distant future. Anyway, let’s talk about May. I started the month at $1,011,854 and ended at $1,036,272 for an increase of $24,418. I put $5,475 into my solo 401k, so my investments appreciated $18,943. I’ll take increases like that any month! 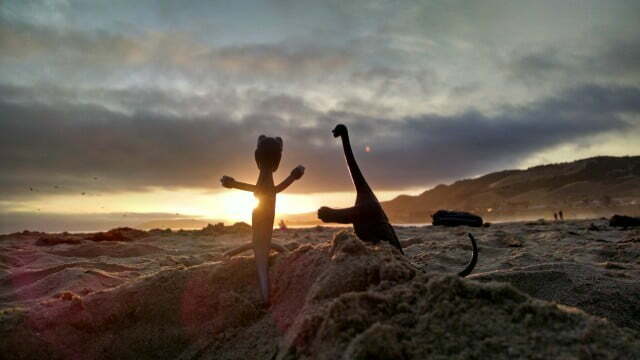 I forgot to take a screen capture of my account gains this month, so please enjoy this picture of Spendosaurus and Frugalsaurus frolicking on Pismo Beach instead. I still like Personal Capital***. As long as I have a job, I’ll be contributing $5,000+ per month to my solo 401k****. Even if the markets didn’t appreciate at all, this alone would allow me to attain my goal of $1,120,000 (one million plus enough to cover our mortgage debt). However, I’m not confident that the markets will be higher in February of 2017 than they are right now. The current bull market is 6 years old while the average one lasts for 4 years. This one started after a severe recession, so I don’t think this is worrisome. However, nothing lasts forever. Eventually, the markets will take a breather and we’ll all see some losses. I need to avoid the One More Year trap: I can easily see myself falling into the vicious One More Year cycle. The best strategy is to force myself to follow through and avoid OMY at all costs. Life will be better on the other side: There are some decisions in life that seem difficult while in the moment, but down the road, it is clear that you made right choice. Leaving full-time employment won’t be easy, but I think that I’ll be much happier afterward. I’m confident in our financial planning, but frugality is most important: I think that Mrs. 1500 and I manage our investments well, but that is only half the battle. We can’t control the greater factors that cause the markets to swing up or down. We can all control our lifestyle choices though and I think that is much more important. If one can live on $40,000 per year instead of $80,000, it takes much less to move the needle. If the markets went south for an extended period of time, just driving for Uber, renting out a room via Airbnb or taking a short term contract job would go a long way to smoothing over a rough patch. Mrs. 1500’s new gig: After taking time off to raise our children, Mrs. 1500 is working again. She is part-time until the fall when both kids will be in school. Her new income will allow us to increase our savings. Real estate: We will probably purchase at least one rental property before I hang up the old keyboard. We are considering one right now actually. The stock market may crash, but people need a place to live and I want some steady cash flow. I’m really looking forward to not working 40 hours per week. I already have my days planned. Code! Programming for fun will keep my brain strong and allow me to work on code I’ve been dreaming about for a while. Exercise! Working out takes a back seat to everything else now. Post-work*****, I’ll be able to exercise as much as I want. Perhaps, I’ll be able to bring my body back to the Schwarzenegger-in-his-prime physique I once had******. Kids! I look forward to being able to take the kids to and from school every day. More books, more playing and more building too. House! Maybe I’ll be able to actually finish the work on our home! Hell, it’s only been going on for 2 years now! Books! Not much time to read now. I have a lot of catching up to do. Phew, that was a mouthful. I’m hungry now. Where are the Cheetos (I’m particularly fond of those hot ones that are dyed an unnatural, violent red color)? Wait, I know what you’re thinking! Stop it! I already told you, none of that stuff for me! But really, where are the Cheetos? Tune in next Tuesday when I update you on my 401(k) rollover experiment. And hopefully the Cheetos. 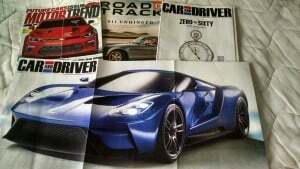 Car magazines: My dentist once told me that he didn’t pay for any of the office magazines. Apparently, once people know that you’re a dentist or doctor, the magazines just start flowing in like water. I am experiencing a version of the same phenomenon. Car magazines have started showing up, even though I never subscribed to them. I love cars, so I appreciate this supernatural happening. Oh, and do you see that blue car in the bottom of the picture? It’s the new Ford GT and has some of the most beautiful lines I’ve ever laid eyes upon (aside from Mrs. 1500 of course [I’ll wait while you roll your eyes]). Way to go Ford! ***This is an affiliate link. If you sign up, the blog makes a little bit of money. Personal Capital is a totally free and superior way to keep watch over your investments. It’s worth it for the fee analyzer alone. I would never recommend anything that I don’t personally use and completely believe in, so give it a try. If you’ve already signed up through the link, please know that I’m super thankful. Next time you make it out my way, pizza and beer are on me. If you haven’t signed up yet, don’t feel bad because I’ll still offer you pizza and beer, but you’ll get Coors Lite instead of the good stuff. Just kidding. Maybe. ****The 401k limit for 2015 is $18,000. Between me, Mrs. 1500 and our own corporation’s contribution (25% of our wages), we can sock away much more than most. *****I hate the word retirement. It has connotations of seniors playing golf or sitting in a retirement (see, there is this awful word again) home, biding their time. I avoid using it at all costs. Looking good. So have you defined the exit plan? I was wondering, what percentage of your assets are held in tax-sheltered accounts? I am asking, because if you had $500,000 today invested in ten-baggers such as TSLA, GOOG in taxable accounts , and you sold them to buy index funds, you would likely have to take a sizeable tax hit of 15 – 23.80% today. Yeah, that is the issue; almost all of those stocks are in taxable accounts. That is why I’m so hesitant to sell. I have no interest in getting socked with a massive tax bill. If I waited until I’m not working, I’d have little to no income, so the tax hit would be much less. A great month for you, although I really would question holding onto that Facebook stock. They haven’t managed to buy SnapChat and that’s what all the cool kids are using (I’m actually serious about that, my youngest brother is 18 and he doesn’t even use his FB account, he asked to snap something to me the other day.). This is something I think about almost every day! I think SnapChat serves a different purpose. One thought I had is that once these 23 year olds turn 30 or so, will SnapChat will be able to retain them? It’s just disappearing pictures, right? You can send “stories” like a group text that can last for 24 hours. You can send money, and there’s a video chat service too. To be honest, it’s a little weird that it’s caught on since I can’t discern anything that’s truly unique about it, but no advertiser has really figured it out, so that’s a cool thing about the platform. I think it will retain users though. It’s like texting only easier for groups to follow. Interesting. The new issue of Bloomberg Businessweek has a cover-story on SnapChat. It is tops on the reading list now. In defense of FB they make money. Snapchat has earned $0 and is worth $3B… I wonder if my website is worth $3B too? I’m by no means a social media power user (although I do have an oddly large collection of FB friends). I’ll sadly (I mean happily) part with 1500days.com for $1B. OK, I’ll take $500,000,000. Still not low enough? $25? I’ll throw in some dinosaurs! With four 10-baggers, I don’t blame you for sticking with stock picking. It’s really hard to justify to yourself moving away from it when you’ve had so much success. Your subconscious is like “pssshhhh Warren Buffet who? I’m Mr. 10-bagger 1500! !” I think taking some risks in your capital accumulation phase of FI is a great idea. But as you get closer to FI, I’m sure cooler heads will prevail and you’ll start to get less concentrated in individual tech stocks. Almost there! Ha ha, you are completely right! I think there is a name for this; recency bias? Still though, I know deep down that it’s not a good, long term strategy. I’d be OK with holding Berkshire Hathaway long term, but pretty much nothing else. I agree about the “one more year” trap and needing to follow through with goals you set out and think through. Once you approach a big decision it can be so easy to let go of all the research you’ve done and try to play it safe. But if you’ve done the research and the work, the best thing you can do is follow through with the plan. Impressive month for sure! I agree with investing in real estate as people need a place to live and it can be leveraged to make other investments. Yeah, I REALLY want the 4 plex too. We live on 3K/month and this thing would bring in 5K. We’d be set if we’re able to get our hands on it. I have a portion of individual stocks in our taxable investments, around 30%, the rest is in index funds and ETFs. As I get closer to retirement I would start moving money as well and keep individual stocks to 10%. Mrs. Budgets @MrandMrsBudgets recently posted…HELP…My Wife Embarrasses Me! You have a much saner portfolio than I. My goal is to never have an individual stock be greater than 10% of my portfolio. It will take a while to get down to that, but it will happen. I love reading about others post work plans. Yours sound very similar to my own! With the house though, we have a bunch of home improvement projects to finish up. This makes it much worse. Totally agreed that its a never ending job. Last week, the sump pump broke and a faucet started leaking. On Tuesday, the electric lawnmower shorted out. Yesterday, a second faucet started leaking. I can’t make this stuff up. Impressive gains, and all that with Apple trending downward a little bit. Sounds like a sure thing to gain another 9% and hit your goal within the next few months, seein’ that 0.5% is from contributions alone. Have you calculated how much your dividends are each month? Along with contributions and dividends, I’m not sure you’ll even need the market to hold up to meet your goal. I have no idea how much dividends are. Apple and Costco pay them and so do the index funds, but I don’t keep close track. The thing with dividends though; don’t stocks usually go down when a dividend is paid out? So, if Apple gives me a dollar, the share price usually goes down a dollar at some point because the company is now worth that much less. Contributions will really make the difference. We should be able to increase them too in the very near future since the &^%^ing house project won’t cost us any more. Agree with you on the Ford though, very pretty piece of engineering! That’s a pretty radical jump from Cheetos to Fruit Loops, are you sure their was no way medical green stuff had any affect in this choice? Great to see you doing well, stocks, jobs, vacations, keep up the good work sir! Looking forward to your retirement post in 2017. It’s easy to lose track of your portfolio. With how important maximizing returns are over the long-term I like to force myself to balance my portfolio and take a look at asset allocations at least annually. Annual rebalancing is a great idea. I need to start doing that! Any super performers in you portfolio that explain more than their fair share of the gain? Facebook accounted for $10,000, so that is the primary culprit. Come on $100/share!! We found some weird Cheetos in Europe. Peanut flavored…even Ketchup flavored. I think I have a photo somewhere. Wow DB40, those sound disgusting! You are in a great financial spot my friend. Keep it up! You’ll be “retired” sooner then you think. I know, I dont like the word retired either. I cant help but think of old folks walking around in robes for some reason when I hear that word. Congrats on the free car mags!! Sounds rad! Your progress is so inspiring! Sometimes I dream about early retirement, but it seems so far away. I can’t wait for your 1500th day!